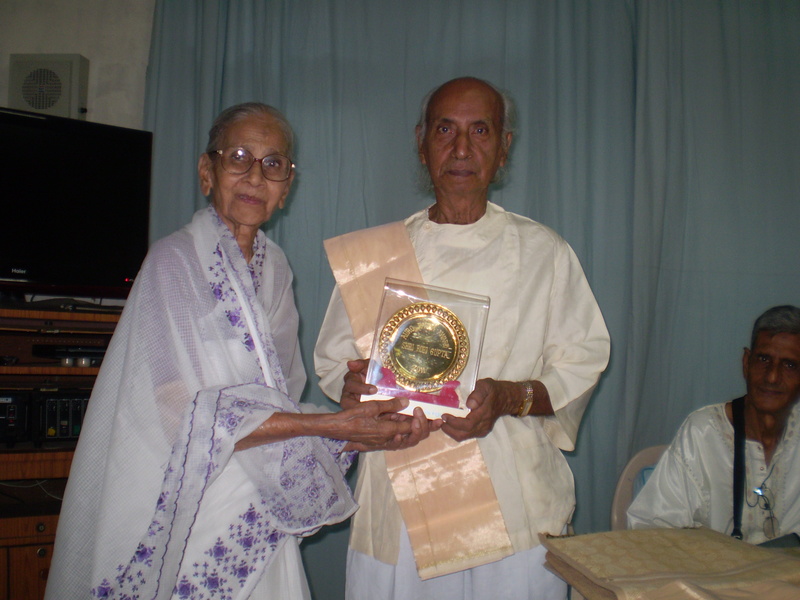 On Sunday, 22 December 2013, Robi Gupta—the foremost Bengali poet of Sri Aurobindo Ashram—has passed on to the Beyond at the age of eighty-seven. Born on 25 July 1926 at Nilphamari in Rangpur (now in Bangladesh) he was the youngest son of Nolini Kanta (13.1.1889—7.2.1984) and Indulekha Gupta (20.4.1905—12.8.1987). Nolini Kanta had settled in the newly formed Sri Aurobindo Ashram at Pondicherry a few months before Robi’s birth. Robi started writing verses at a very early age. Even when he was asleep he used to feel certain lines of poetry coming to him but when he would get up in the morning and try to put them down on paper he found it difficult to do so. So he would go to bed armed with a pencil, a notebook and a torch so that whenever he got any poetic inspiration during his sleep he would get up and note it down. When this news was reported to Nolini Kanta Gupta at Pondicherry he had remarked about his youngest son: “Genius!” Robi would send some of his poems to his father and these poems were seen and corrected by the likes of Dilip Kumar Roy, Sahana Devi and Nishikanto Raichowdhury and sent back to him. Robi visited Sri Aurobindo Ashram for the first time on 19 April 1944 after appearing for his school final examination. His elder brothers Samir Kanta (7.2.1922—6.6.2013) and Subir Kanta (19.10.1923—7.12.2013) had already joined the Ashram as permanent members. On 24 April he had the Darshan of Sri Aurobindo. The impact of the Darshan was such that he had made up his mind to stay in the Ashram for ever. To quote his own words: “To me, the word darshan had ceased to become a mere word and had become like a glorified Canto. When he informed the Mother about his wish, she replied: “I agree.” Thus, he became an inmate of the Ashram even before he turned eighteen and did not step out of Pondicherry ever since. Sri Aurobindo had once written in jest that he was the Head of the Department of Poetry in the Ashram. The members of this Department of Poetry—who have enriched the treasures of spiritual or mystic poetry—included the likes of Dilip Kumar Roy, K.D. Sethna alias Amal Kiran, Harindranath Chattopadhyay, Sahana Devi, Arjava, Nirodbaran, Nishikanto Raichowdhury, Pujalal etc. Robi happened to be the last surviving member of the said department. Some of his poems in Bengali were read out to Sri Aurobindo by Nirodbaran. As a mark of his appreciation, Sri Aurobindo had given him the title of ‘Tagore of the Ashram. 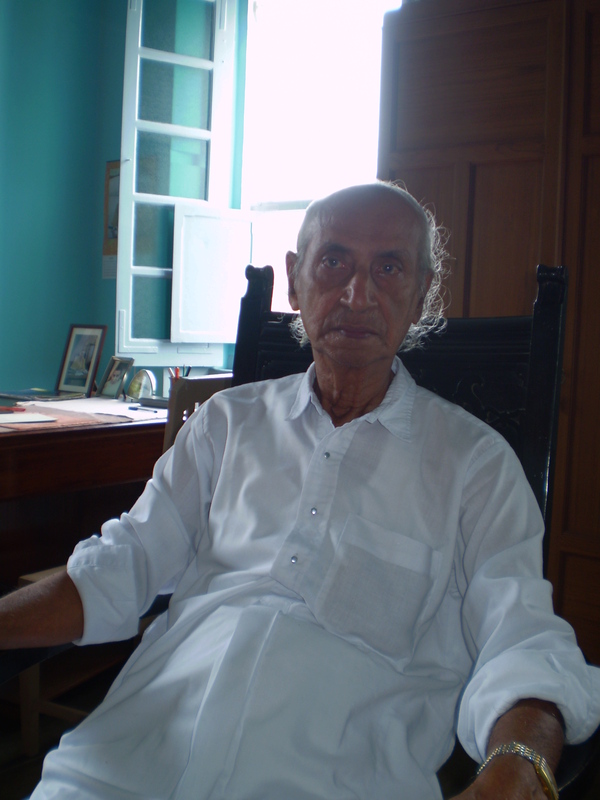 His anthologies of Bengali poetry include titles like Swapani (1950), Marmomoral (1952), Mandakini (1953), Sarani (1965), Gitiargha (1965), Shiulijhora Bhorer Alo (1998) and Ahoroni (2009). His style of writing was so unique that even his prose-works (for instance, his reminiscences Smritipote which was serialized in the Bengali monthly magazine Srinvantu in the early 1980s) had become impeccable poetry. ‘Poetry is the highest form of language that should express Truth, Beauty and Harmony in a beautiful way which, ordinarily, our ears cannot hear and eyes cannot see. 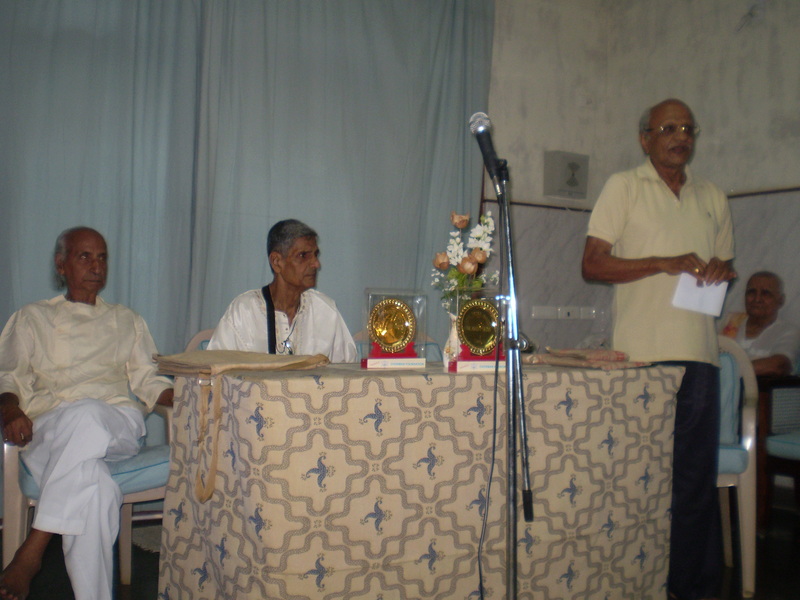 If this is the real purpose of poetry, nay, if the true aim of the poet is to make reader’s mind enriched with profound thoughts and ennobled with lofty ideas, then “Swapani” the recently published poetical work of Sri Robi Gupta, a young poet of Pondicherry Ashram, has seen a splendid success. ‘The book is a fine collection of forty four poems in Bengali. There is poetic ecstasy that has sprung from his deep personal experience. The verses, therefore, have the rhythm of spiritual joy. The style has elegance and fluency in giving out perfect and happy expression of sober idea and intense feeling. Robi was a linguist and an avid footballer and hockey-player. For a number of years he had taught in the Ashram School. For his contribution in the field of Bengali literature, he was awarded the ‘Sri Aurobindo Puraskar’ and ‘Auro-Ratna Award’ by Sri Aurobindo Bhavan (Kolkata) and Overman Foundation respectively. Robi-da was a perfect gentleman. He always encouraged budding poets and writers and also conveyed his appreciation to them either directly or through someone else whenever he read anything good authored by them. Like the late poet Nishikanto Raichowdhury he would gift poems written by him to individuals on their birthdays or other occasions. 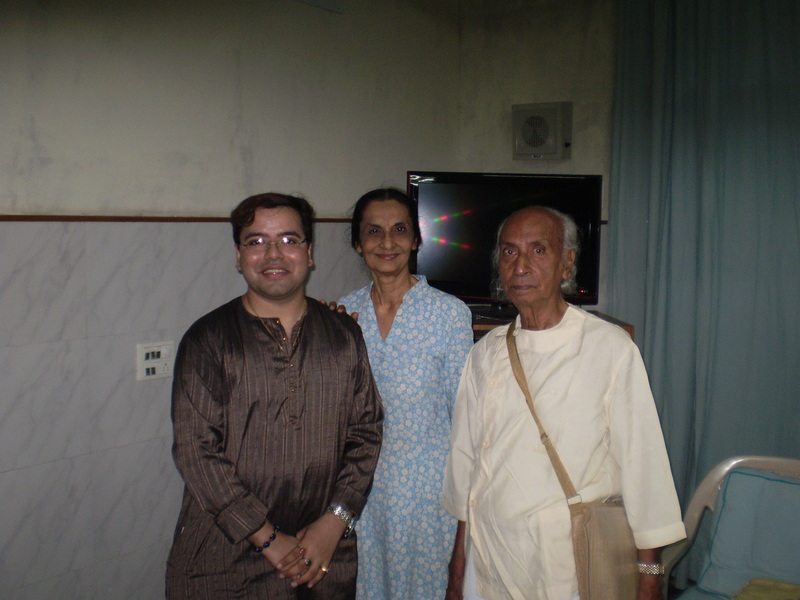 In November 2013 Robi-da had spent a fortnight in the Ashram Nursing Home. 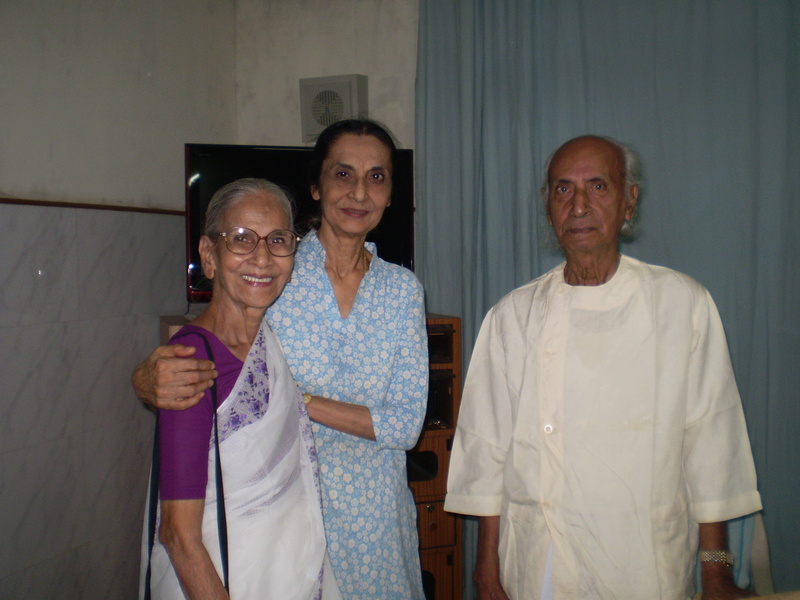 On 7 December he lost his elder brother Subir Kanta Gupta—better known as Manju-da in the Aurobindonian community. The eldest brother Samir Kanta alias Ranju-da had already passed away on 6 June 2013. The death of his elder brothers had made him lonely and sad. In the late hours of 22 December 2013 he joined them in the Mother’s lap. 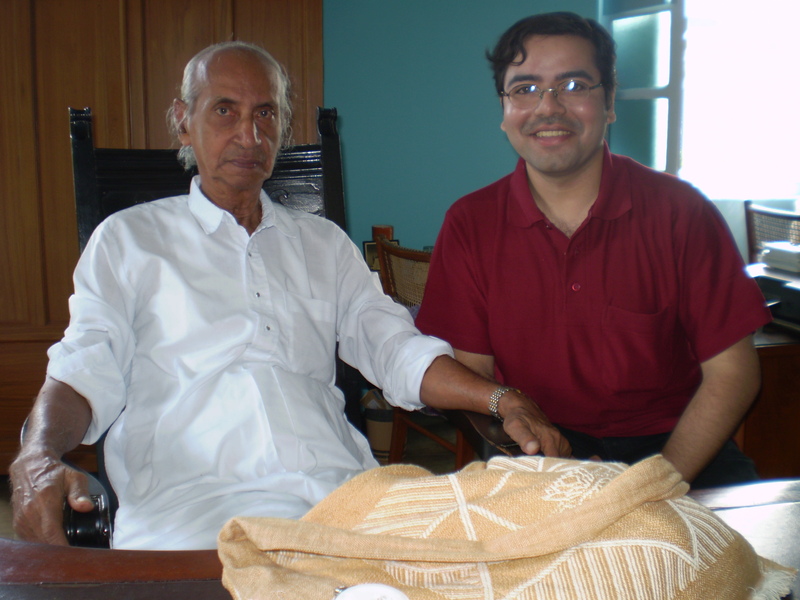 With Robi-da’s demise the firmament of Aurobindonian poetry has lost its brightest star. His poetry has immortalized him so he would continue to shine like a Sun in the heart of every lover of poetry. Robi Gupta with Anurag Banerjee. 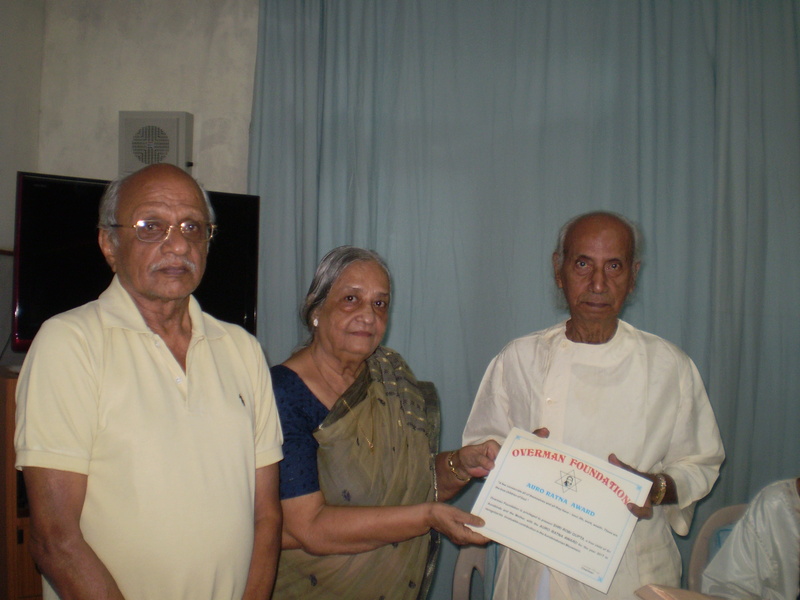 Robi Gupta with Dr. Ananda Reddy and the late Togo Mukherjee at the second ‘Auro-Ratna Award’ ceremony in August 2011. 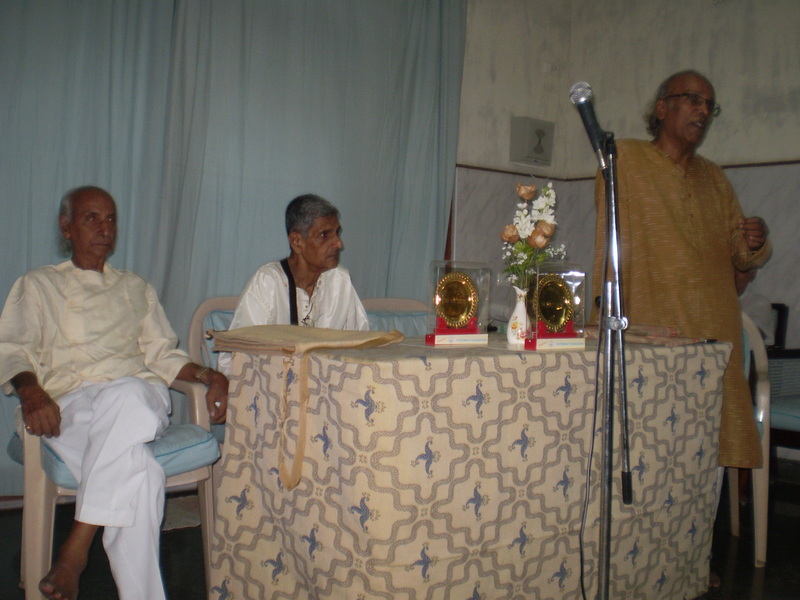 Robi Gupta with Prof. Kittu Reddy and the late Togo Mukherjee at the second ‘Auro-Ratna Award’ ceremony in August 2011. Robi Gupta receiving the ‘Auro-Ratna Award’ from Ms. Suprabha Nahar. Robi Gupta with Prof. Kittu Reddy and Ms. Krishna Chakravarti. Robi Gupta with Ms. Suprabha Nahar and Ms. Jhumur Bhattacharya. Robi Gupta with Anurag Banerjee and Ms. Jhumur Bhattacharya. Good bye again ‘ the flight of angels shall sing thy soul to rest ” only to continue next your upward journey ..
Robi astomito holeo anurage bhora tar kobita aamader prerona jogabe. a elderly person , it did not strike my mind. I did read this article though. My son name is Anurag too. “The other day Nolinida told us something very interesting about his first darshan of you. He was sent by Barinda to call you to the Maniktola Garden. He was waiting in a room downstairs at Raja Subodh Mullick’s house, when you came down, stood near him and gave him an inquiring look. He said in Bengali, ‘Barin has sent me. Would it be possible for you to come to the Garden with me now?’ You answered very slowly, pausing on each syllable, – it seemed you had not yet got used to speaking Bengali – and said, ‘Go and tell Barin, I have not yet had my lunch. It will not be possible to go today.’ He did not say a word, did his namaskar and went away.” All the children were smiling and so was Sri Aurobindo.